This is exactly the sort of card I like to see in silver-bordered sets. It refers to Magic as a broader game and phenomenon, and makes mechanical use of things that are usually never made use of in Magic. Its metagame elements also make use of things that are usually not considerations in Magic metagames. For example, the kind of player who makes decks themed around a particular type of artist overlaps with the kind of player who is drawn to artists with a very distinctive style, which might be recognized by experienced opponents. You can use it as an element of alliances in multiplayer settings, where a wrong guess will give someone a token they can (hopefully!) use in the way you want. Also, many playgroups end up knowing things like which of their members like which artists, and thus have a better chance at foiling it. But as always, I think if you’re thinking too much about things like that, you’re potentially missing out on some of the fun of silver-bordered cards – the guessing game is a fun diversion from “normal” Magic, and surprisingly hard to play with cards from sets like Kaladesh or Amonkhet; and if it encourages people to pay more attention to the art, then all the better. Ever since Shards of Alara I have played with the idea of making an deck where every card, even lands, have the same artist. Of course, Squirrel Farm would be a terrible card to put in that deck but the point I’m stumbling to make is that I like art matters as a mechanic. 5 mana for an initial 1/1 is bad to say the least, but that’s not the point of this card. It’s hard to numerically calculate the “fun” value of a card but I’m gonna try. The mind games created by the trivia is the reason to play this card. This card has high variance depending on how long your opponent has been playing. If you really want to mess with your opponent you can show them a card they got wrong three turns later. You’d be surprised how many times people will forget the answer. Although moot from Commander, this enchantment encourages you to play multiples with different art, which is pretty fun. In limited this card gains points by having Squirrel tribal, but loses points because chances are your opponents are familiar with the artists in the shallow card pool, especially in draft. Let’s hope you don’t have a deck filled with Kev Walker, Terese Nielsen, and Rebecca Guay cards, right? Squirrel Farm is pretty innocuous overall; it’s not particularly efficient (5 mana for the chance at a 1/1 token, even if it’s the second-best creature type in the game), but being repeatable helps it out a good deal. 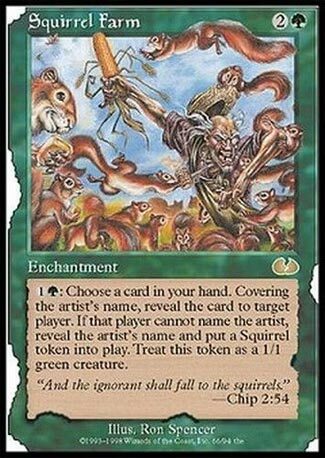 And with the general homogeneity of Magic art these days (not meant as a knock, just that fewer artists have a distinctive style), it might be easier to get this to work and get Squirrels out of it. And we all love Squirrels. It’s a cute idea that’s honestly underpowered, even by the standards of the Un-sets. It still gets points for squirrels.